Horse Chestnut trees or Aesculus species are an interesting group of trees, often confused with another species (Castanea) as being grown for the nuts, however they have different uses in the garden. Aesculus include the common horse chestnut or Aesculus hippocastrum, and these are not edible, they are grown as shade trees. 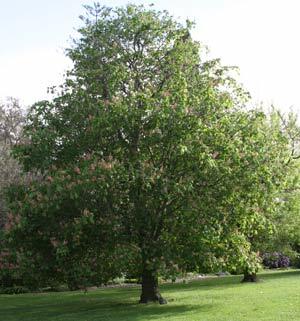 However it is the other Aesculus species and cultivars may prove even more garden worthy, some make good specimen trees, shade trees and others have wonderful flowers. A. hippocastrum baumannii – Attractive large double white flowers, it does not set seed and the flowers are showy. A. x carnea Briotii – This is a hybrid, grown as an ornamental shade tree, wonderful red flowers in spring. A. indica is the Indian Horse Chestnut.